You might have observed that a frying pan becomes hot when kept on a flame. It is because the heat passes from the flame to the utensil. When the pan is removed from the fire, it slowly cools down. Why does it cool down? The heat is transferred from the pan to the surroundings. So you can understand that in both cases, the heat flows from a hotter object to a colder object. In fact, in all cases heat flows from a hotter object to a colder object. Take a rod or flat strip of a metal, say of aluminium or iron. Fix a few small wax pieces on the rod. These pieces should be at nearly equal distances. Clamp the rod to a stand. If you do not find a stand, you can put one end of the rod in between bricks. Now, heat the other end of the rod and observe. The process by which heat is transferred from the hotter end to the colder end of an object is known as conduction. In solids, generally, the heat is transferred by the process of conduction. Do all substances conduct heat easily? You must have observed that the metallic pan for cooking has a plastic or wooden handle. Can you lift a hot pan by holding i t from the handle without getting hurt? Heat water in a small pan or a beaker. Collect some articles such as a steel spoon, plastic scale, pencil and divider. Dip one end of each of these articles in hot water. Wait for a few minutes. Touch the other end. Enter your observation. The materials which allow heat to pass through them easily are conductors of heat. For examples, aluminum, iron and copper. 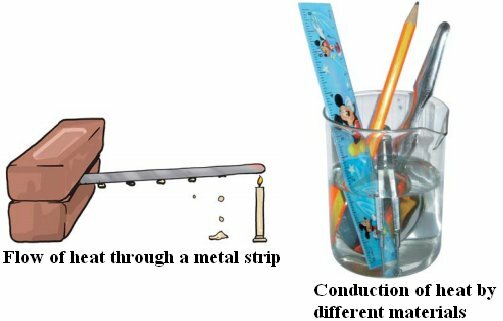 The materials which do not allow heat to pass through them easily are poor conductors of heat such as plastic and wood. Poor conductors are known as insulators. The water and air are poor conductors of heat. Then, how does the heat transfer take place in these substances? Let us find out. 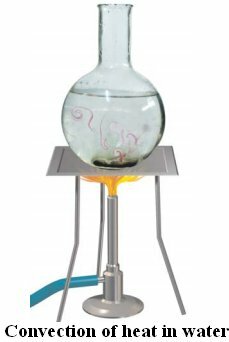 Take a round bottom flask (if flask is not available, a beaker can be used). Fill it two-thirds with water. Place it on a tripod, or make some arrangement to place the flask in such a way that you can heat it by placing a candle below it. Wait till the water in the flask is still. Place a crystal of potassium permanganate at the bottom of the flask gently using a straw. Now, heat the water by placing the candle just below the crystal. Write your observation in your notebook and also draw a picture of what you observe. When water is heated, the water near the flame gets hot. Hot water rises up. The cold water from the sides moves down towards the source of heat. This water also gets hot and rises and water from the sides moves down. This process continues till the whole water gets heated. 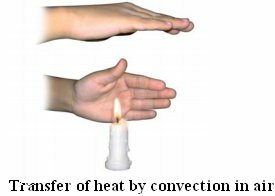 This mode of heat transfer is known as convection. The air near the heat source gets hot and rises. The air from the sides comes in to take its place. In this way the air gets heated. The following activity confirms this idea. Light a candle. Keep one hand above the flame and one hand on the side of the flame. Do your hands feel equally hot? If not which hand feels hotter? And why? Notice that towards the top, the air gets heated by convection. Therefore, the hand above the flame feels hot. On the sides, however, there is no convection and air does not feel as hot as at the top. The people living in the coastal areas experience an interesting phenomenon. During the day, the land gets heated faster than the water. The air over the land becomes hotter and rises up. The cooler air from the sea rushes in towards the land to take its place. The warm air from the land moves towards the sea to complete the cycle. The air from the sea is called the sea breeze. To receive the cooler sea breeze, the windows of the houses in coastal areas are made to face the sea. At night it is exactly the reverse .The water cools down more slowly than the land. So, the cool air from the land moves towards the sea. This is called the land breeze. When we come out in the sun, we feel warm. How does the heat from the sun reach us? It cannot reach us by conduction or convection as there is no medium such as air in most part of the space between the earth and the sun. From the sun the heat comes to us by another process known as radiation. The transfer of heat by radiation does not require any medium. It can take place whether a medium is present or not. When we sit i n front of a room heater, we get heat by this process. A hot utensil kept away from the flame cools down as it transfers heat to the surroundings by radiation. Our body too, gives heat to the surroundings and receives heat from it by radiation. All hot bodies radiate heat. When this heat falls on some object, a part of it is reflected, a part is absorbed and a part may be transmitted. The temperature of the object increases due to the absorbed part of the heat. Why are you advised to use an umbrella when you go out in the sun? In solids, generally, the heat is transferred by conduction. In liquids and gases the heat is transferred by convection. No medium is required for transfer of heat by radiation. The materials which allow heat top as through them easily are conductors of heat. Dark-coloured objects absorb radiation better than the light-coloured objects. That is the reason we feel more comfortable in light-coloured clothes in the summer.